Now that I commute to the suburbs every day, trying to find new and interesting burgers is like a scavenger hunt. Luckily, I can drive home through Chestnut Hill and Mount Airy if I so choose, giving me more options than Irish pub food or chain restaurants. This week, I stopped into newly opened Cresheim Valley Grain Exchange in Mount Airy as I saw on their Facebook page that Mondays were half-price burger nights (and you guys know how much I love a good burger deal). Their Farmhouse burger is an all natural, grass-fed beef patty topped with Cooper sharp American cheese, Applewood bacon, bibb lettuce and sweet tomato jam on a potato bun. 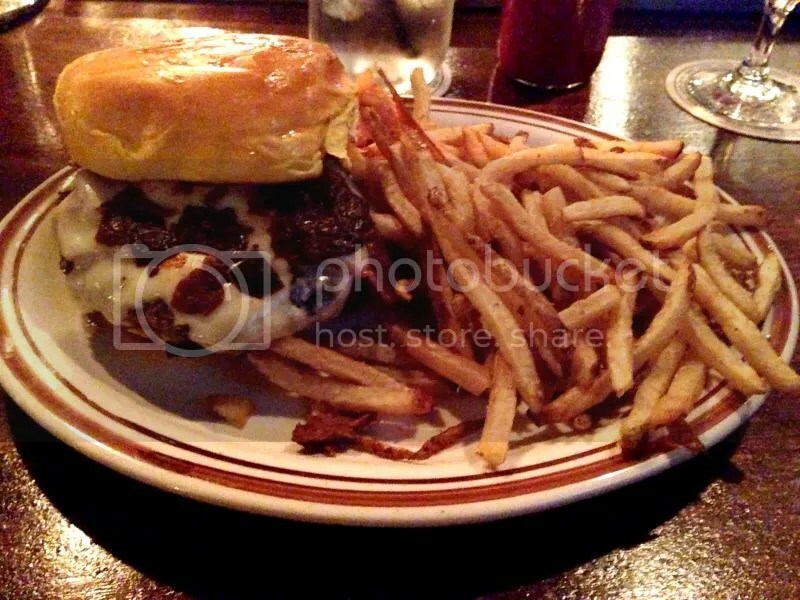 The burger came out cooked perfectly medium, the grass-fed beef juicy and flavorful. The sweet tomato jam wasn’t overpowering (which I had been concerned with initially when reading the menu) and added a nice tang. The cheese was gooey and the bacon was thick cut with a good crunch to it. The potato bun was so soft and delicious, it was like eating a burger that was sandwiched between a cloud! Good burger to bun ratio; I never once worried about a soggy bottom bun or running out of bun before burger. For having only found out about this place hours before eating here, the Grain Exchange really knocked it out of the park on the first try! Posted in bacon, buns, burger, burgers, cheese, Cresheim Valley Grain Exchange, grass fed, Mount Airy, potato bun, tomato jam. Bookmark the permalink.